Composer BC SMITH: From the powerful groundbreaking music of his first film score SMOKE SIGNALS (Sundance Film Festival’s Audience Award and Filmmakers Trophy winner), to the minimalist electronic textures of the upcoming Mandalay Pictures / Netflix film AMATEUR, BC Smith is one of those rare composers firmly entrenched in a world of diverse and eclectic musical styles. Whether working with modular synthesizers, multifarious ensembles, large orchestras, peyote singers, aleatorics or electronics, BC believes that film scoring is an evolving art form and he approaches every film from its own unique perspective. A multiinstrumentalist, he is known for his unique collection of bespoke instruments and electronics. He believes that audiences crave new sounds and he’s passionate about creating an original sonic pallet and score that is truly born from the story, psychology and aesthetic of each film. 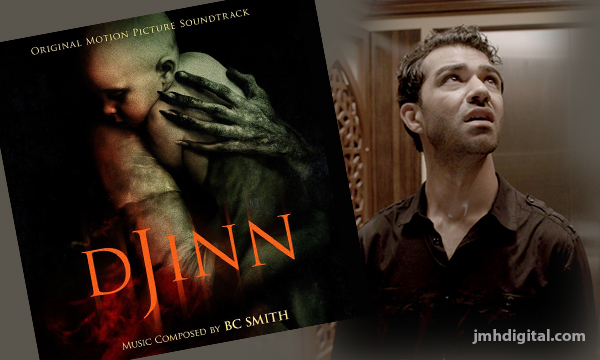 Get you Djinn now, it will steal your heart! 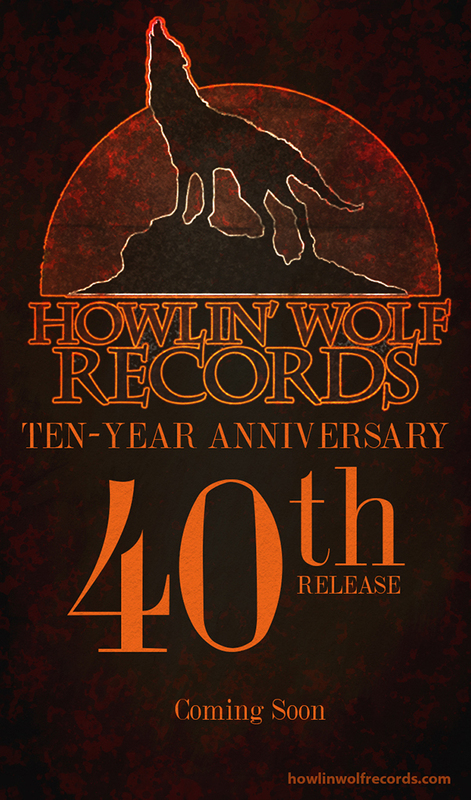 Howlin' Wolf Records is very proud to celebrate the label's TEN YEAR ANNIVERSARY with the release of its 40th catalog entry, the conclusion to Stevan Mena's MALEVOLENCE Trilogy, titled MALEVOLENCE 3: KILLER. 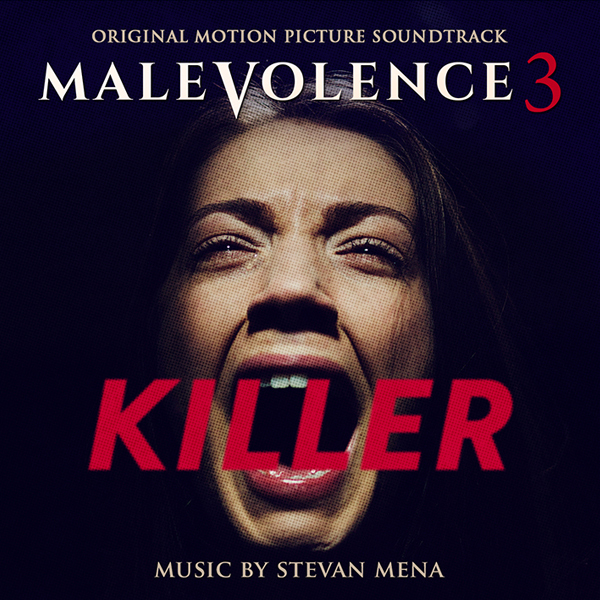 On April 10, 2009 the label released its first soundtrack title MALEVOLENCE, which was the directorial debut of filmmaker Stevan Mena, who served as the film's screenwriter, director, producer, editor, and composer! The label's Mission Statement, as printed on the "ABOUT US" page, remains unchanged after ten years of producing soundtrack releases, and is very much inspired by its first soundtrack release MALEVOLENCE. Jeremy [Six Strings]: Can you tell us how you got involved on this project DJINN and how you approached this score musically? BC Smith: I received a call from one of the producers asking me to demo a scene from the film for a music meeting the following day. 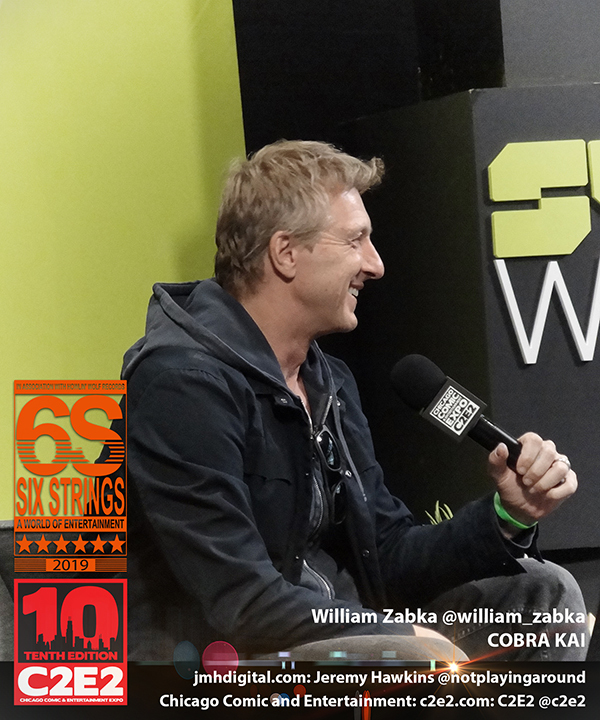 The filmmakers were feeling that the movie wasn’t scary enough and wanted to see what a modern synth-based score might sound like. The meeting was in Abu Dhabi, so they actually needed it in a few hours. I was a fan of Tobe’s work, so I happily banged out music for the clip and sent it off. I didn’t hear a word for months, until I was asked to fly to Abu Dhabi for a spotting session. Though the movie takes place in the UAE, the filmmakers didn’t want to use any regional sounds beyond the Lullaby motif that occurs throughout the film. Salama's themes needed to be beautiful, sad and resonate with all audiences. It was also very important that Um Al Duwais didn’t devolve into a horror villain caricature. The Djinn are a part of Islam and needed to be handled respectfully. It’s a bit of a daunting task, if you think about it. Luckily for me, the constraints and limitations of a project often fuel my creativity and I quite enjoyed the challenge. As with most of my scores I created a sound pallet from scratch to give the movie its own vibe. Much of the tension in the film comes from Salama slowly losing her grip on reality. The score has a dreamlike quality that turns harsh, as the story unfolds and Um Al Duwais's motivations becomes known. To me, Salama's fear shouldn't sound like conventional orchestration or writing. It needed to come from a much darker place, from the horrific secrets she carries. With that in mind, I liked juxtaposing Salama’s tonal and beautiful themes with atonal and noise-based elements. Salama is alone for much of the film, and I also used silence as a part of the composition to underscore that isolation. It was a given that the music needed to raise the fear factor, but it was also equally important that the audience felt empathy for Salama. The audience really needs to stay on her side, despite the implications that she might have been complicit in the death of her child. This film is really about two mothers' grief. How that grief manifests brings about some scary consequences. 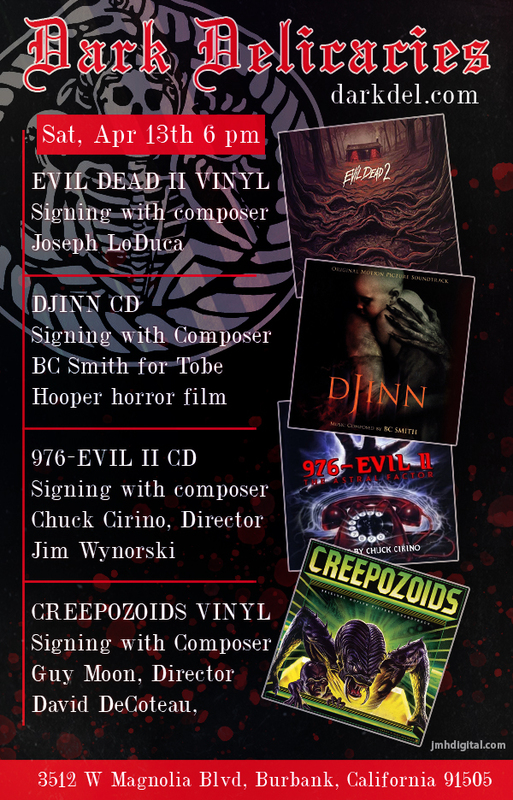 Jeremy [Six Strings]: How much interaction did you have with this project DJINN from director (Tobe Hooper) to the producers? BC Smith: I came on DJINN very late in post. There were revisions with the edit, and lots of new special effects work were in the process of being completed. I think it had been in and out of post for quite some time. By this point in the process, I had missed the traditional composer-director collaboration, working in a "bubble" time-frame. Given that producers were all based out of UAE, outside of our spotting session, all the contact and approvals were done by email. This is not an unusual scenario for me, given the way movies are made these days. I work on projects from around the world, so I’ve become quite adept at creating a workflow that makes everyone comfortable. 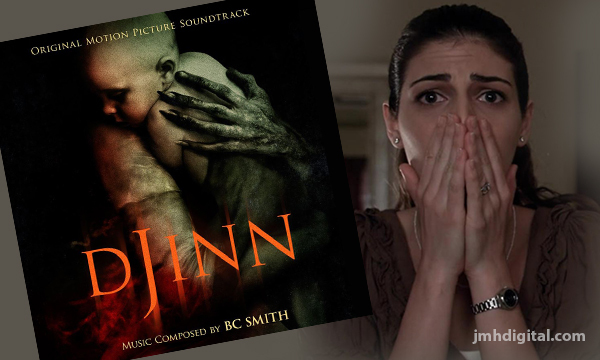 DJINN was a situation where the filmmakers thought things weren’t scary enough, and the plot wasn’t flowing. Most everything I sent off was lifting the film to where they wanted to go, so approvals went very quickly. To be honest, I had very little interaction with anyone. There really wasn’t a lot of back and forth. It was mostly, "we like this..., or "give us more..." Unfortunately, Tobe passed away before I had the opportunity to meet him in person. Jeremy [Six Strings]: Did you work with anyone on this project DJINN, and can you also share any stories good or bad or both? BC Smith: It was decided early on that it would be an electronic-based score. By nature, that cuts down the amount of musicians I bring on the project. I worked with my engineer Bob Demaa, who mixed and created some of the synths I used. He had just broken up with his girlfriend, and was channeling some anger that really benefited the film. We’ve had a good laugh about it in hindsight. I also worked remotely with the amazing vocalist Azam Ali. She truly captured both Salama's grief and Um Al Duwais’s fury. I’m recalling that she was in the middle of a burst water pipe in her studio. Like Bob, it’s possible that outside stress contributed to her emotional vocal performance. I’m really only speculating, as she is the consummate professional. Regardless, I was very grateful she was able to work the project into her schedule. She is a phenomenal talent. It’s such a pleasure to receive a remote track that exceeds what you hoped you could get. Jeremy [Six Strings]: How did you decide that Howlin' Wolf Records was the place to release this project DJINN? BC Smith: I had a few conversations with a friend about which label might be right for the project. I reached out to directly to Wall from Howlin’ Wolf after the recommendation. From our first conversation, I liked Wall’s thoughts on everything. I didn’t need to look elsewhere. The licensing agreement is complicated so it’s a very small, very limited release. Some might think that makes it a release not worth pursuing, but I believe that Wall felt that the limited aspect is what makes it kind of special. That is certainly the approach I took, and I’m grateful to Wall and everyone at Howlin’ Wolf for their patience and tremendous support. They also brought on Javier Burgos to design the CD packaging. He is brilliant and so easy to work with. I loved everything he created. Jeremy [Six Strings]: Can you share something about music, that is not covered in your bio, or a favorite composer and why? BC Smith: I’ve played synths and keyboards on records for a bunch of bands including Good Charlotte, Hollywood Undead, Dashboard Confessional, John Doe, Bon Jovi, the Veronicas, and many more. It’s mostly been a situation where a band wanted to add interesting synths and electronics to their songs, but I’ve also done some string arrangements, I grew up playing in rock bands so it’s an enjoyable thing for me to do. I’m proud of the work but not sure if it’s relevant to my film scoring career, so I leave it off my propaganda. Also, not noted is that I’ve written a couple batches of cues for music libraries and that work has found its way into a huge amount of TV shows from around the world. I’m surprised at how much it continues to get used. It has to be in the hundreds of episodes across all manner of TV. At heart though, I’m really a bespoke composer. Every score of mine is different and crafted uniquely for the film. That is what I like most, and what I do best. Regarding a favorite composer of mine: I’m a big fan of film music. When done well, it's a bridge to empathy and connection with the characters and story. I love the scores of Goldsmith, Hermann, and many of the classic Hollywood composers. That being said, film scores are an evolving art form and I also tend to gravitate toward those that continue to push the boundaries and defy convention. Jóhann Jóhannsson was a favorite of mine. I loved his versatility, working with both electronics, live players and orchestras. I also try to cultivate that same scope and diversity within my scoring projects. Jeremy [Six Strings]: What are you hoping the fans of this project DJINN, from film to score, will walk away with musically? BC Smith: My job is to help tell the story of the film with music. My hope is that from the very first sounds of malevolence, churning synths and Azam’s haunting voice, the audience is transported into the world of the film. With Tobe’s death, the industry lost an icon of the horror genre. DJINN holds a special place in Tobe’s legacy as the last project he completed. Pushing for a soundtrack release was my own personal way to honor that legacy. This CD is such a small thing, but something tangible folks can hold onto. I hope the soundtrack resonates with his fans and the limited availability makes it something special. - What will you personally take away from this project DJINN and how did this build to your next project? BC Smith: One of the joys of my career has been the diversity of films I’ve scored. It’s been quite a fun ride. While composing for DJINN and another film, WEST OF REDEMPTION, I discovered that I really like scoring suspenseful films. I’m always fascinated by the psychology of how and why music works in film, and within that genre there just seems to be an incredible amount of creative opportunity for music. I probably approach things differently than a traditional genre composer and I’d really like to explore that world further. 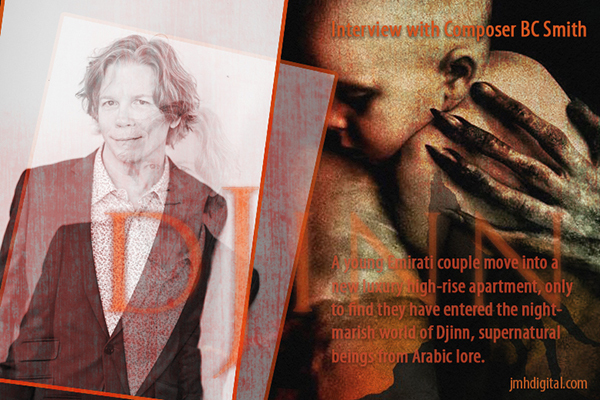 Specifically, I’d love DJINN to build toward scoring more spooky films. Jeremy [Six Strings]: What do you hope you will see by the end of 2019; from your music, life or in the world? BC Smith: In the world and particularly the US there is lot of divisiveness. Life is not a zero-sum game and it’s very unfortunate that our government is sowing such a fear-based, discordant mentality. I’m troubled, but also motivated to action now. We need a return to kindness and compassion. We need to take care of our planet. I’m very happy work in an industry that provides a bit of escapism for folks. My musical goals are simply continuing to attract interesting films to score. I also have a very exciting collaboration with Alessandro Cortini from NIN. We’ve done some really great film and commercial work together, and have more on the horizon. He’s just come off the road so we’re considering our next projects and hope to find a good sci-fi film to score together. THANK YOU, BC SMITH FOR TAKING THE TIME TO CHAT! BC SMITH: From his first film score, Chris Eyre and Sherman Alexie’s SMOKE SIGNALS (Sundance Film Festival’s Audience Award and Filmmaker Trophy winner), to horror master Tobe Hooper’s final film DJINN, to Steven Cantor’s Hulu documentary BALLET NOW, BC Smith is one of those rare composers firmly entrenched in a world of diverse and eclectic musical styles. Whether working with modular synthesizers, multifarious ensembles, large orchestras, peyote singers, aleatorics or bespoke electronics, BC approaches every movie from its own unique perspective, creating an original sonic pallet and score that is truly born from the film's story and aesthetic. 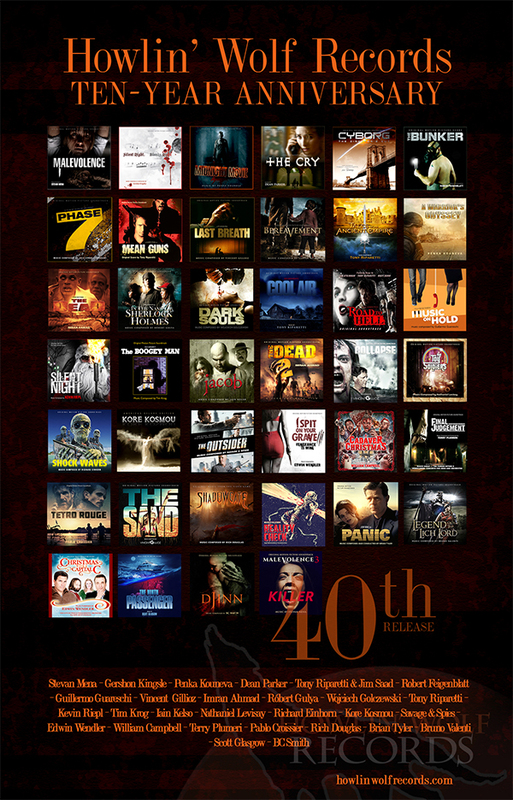 Notable projects include Chris Eyre’s award-winning films, SKINS, EDGE OF AMERICA and the Robert Redford produced Tony Hillerman detective series (THIEF OF TIME, SKINWALKERS, COYOTE WAITS), MGM’s MOD SQUAD, the John Cusack and Emma Roberts starred ADULT WORLD, AMANDA AND JACK GO GLAMPING staring Amy Acker and David Arquette, and Netflix’s Ryan Koo drama AMATEUR. 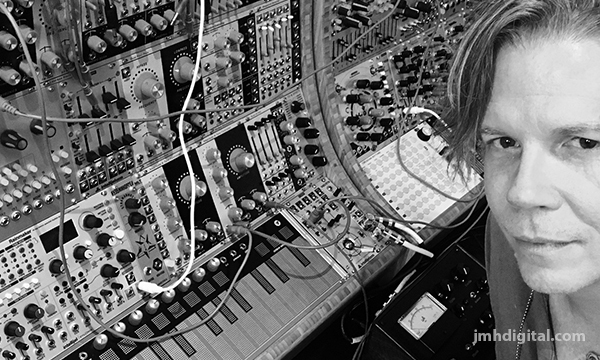 His love of pushing boundaries has led to his ongoing collaboration with Nine Inch Nails / How To Destroy Angels multi-instrumentalist Alessandro Cortini under the nom de guerre ACBC. Winners of a bronze Clio and silver Eurobest Cannes Lion for their music, their international projects include Gus Van Sant and Martin Werner directed campaigns for BMW, the award- winning 8 part Woodkid directed films for Rihanna’s album ANTI and the firefighting documentary BURN, winner of the Tribeca Film Festival’s Audience Award. Currently, he is delivering his score to the sci-fi film ALT starring SALEM'S Elise Eberle and Sloane Morgan Siegel, collaborating with Steven Cantor again for the documentary HOOD RIVER and attached to score the family autism drama LANGUAGE ARTS. BC is also an accomplished amateur magician and member of the Academy of Magical Arts world famous Magic Castle. He specializes in intimate curated evenings of close up magic, haunted artifacts and paranormal entertainment. His wife is a commercial airline pilot and when he’s not scoring films, they travel globally with their five-year-old son. 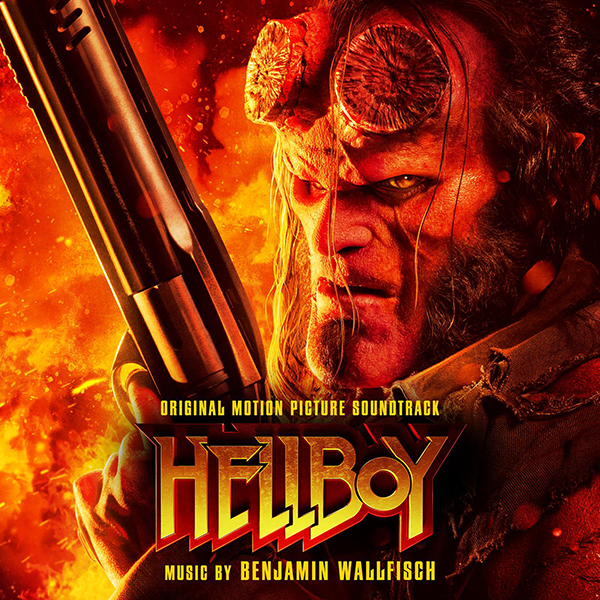 Sony Music announces the release of HELLBOY (ORIGINAL MOTION PICTURE SOUNDTRACK) with music by Golden Globe®, GRAMMY® and BAFTA®-nominated composer BENJAMIN WALLFISCH (It, Blade Runner: 2049, Hidden Figures). Available everywhere Friday, April 5, the album features music from the hugely anticipated film, based on the Dark Horse Comics character of the same name. Hellboy will make its theatrical debut on Friday, April 12, 2019 via Lionsgate’s Summit Entertainment label. Hellboy is back, and he’s on fire. From the pages of Mike Mignola’s seminal work, this action packed story sees the legendary half-demon superhero (David Harbour, Stranger Things) called to the English countryside to battle a trio of rampaging giants. There he discovers The Blood Queen, Nimue (Milla Jovovich, Resident Evil series), a resurrected ancient sorceress thirsting to avenge a past betrayal. Suddenly caught in a clash between the supernatural and the human, Hellboy is now hell-bent on stopping Nimue without triggering the end of the world. Hellboy also features Ian McShane (John Wick), Daniel Dae Kim (Hawaii Five-0 and Lost), and Sasha Lane (American Honey). Summit Entertainment and Millennium Films presents Hellboy, a Lawrence Gordon/Lloyd Levin production, in association with Dark Horse Entertainment, a Nu Boyana production, in association with Campbell Grobman Films. 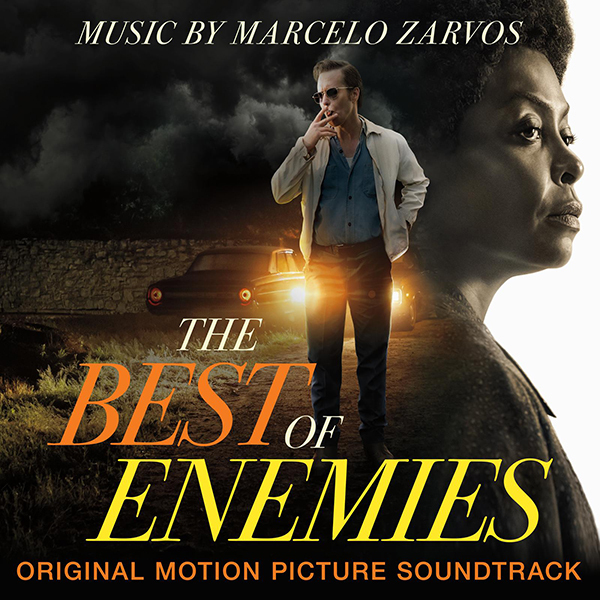 Sony Music announces the release of THE BEST OF ENEMIES (ORIGINAL MOTION PICTURE SOUNDTRACK), with music by composer MARCELO ZARVOS (Wonder, Fences, Enough Said, The Chaperone). Available Friday, April 5, the soundtrack features music from the Taraji P. Henson and Sam Rockwell-starring film, which makes its theatrical debut via STXfilms on Friday, April 5. Based on a true story, The Best of Enemies centers on the unlikely relationship between Ann Atwater (Taraji P. Henson), an outspoken civil rights activist, and C.P. Ellis (Sam Rockwell), a local Ku Klux Klan leader who reluctantly co-chaired a community summit, battling over the desegregation of schools in Durham, North Carolina during the racially-charged summer of 1971. The incredible events that unfolded would change Durham and the lives of Atwater and Ellis forever. Robin Bissell makes his directorial debut from his own script, which is based on the novel The Best of Enemies: Race and Redemption in the New South by Osha Gray Davidson. MovieScore Media continues its exploration of great documentary scores through the new soundtrack of French Emmy-winning composer Cyrille Aufort (A Royal Affair, Past Life, Knock). 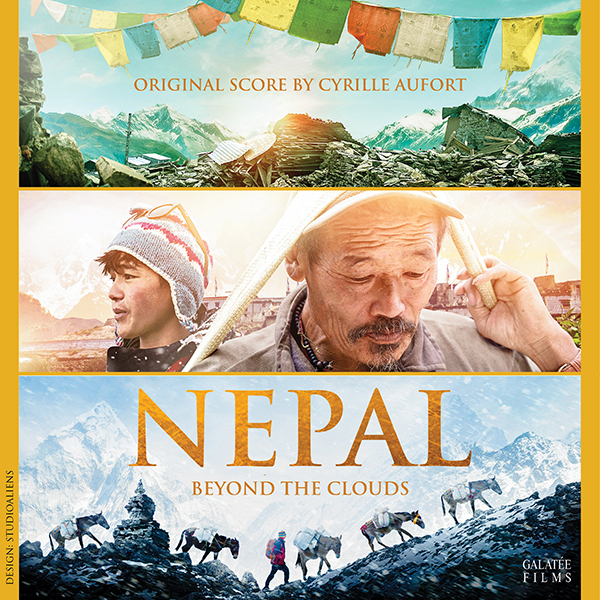 Directed by Eric Valli, Nepal, Beyond the Clouds takes viewers to the small kingdom in the middle of the Himalayas, where the real life tragedy of the 2015 earthquake in Nepal left 9000 people dead and 23000 injured. The film follows two young teenagers, Raj and Shiva in the aftermath of the earthquake that devastated their country. Besides getting their share of the rebuilding process, the two young boys are forced to become men as they are to cope with their own individual losses so that the healing process could begin. “Raj and Shiva's strength, pugnacity and innocence largely inspired the music for the film,” says Cyrille about the origins of his contributions. “The score, built on a set of 12 strings and 2 soloists (viola and cello) and mixed with synthetic colours, helps to reveal a natural world as beautiful as it is inhospitable and fabulous landscapes as harsh as the climate. For his part, director Eric Valli wanted the music to highlight the strength of men rebuilding their country with meager resources in the face of nature unleashed.“ With hints of the local musical scene, Aufort uses a beautiful symphonic palette to emphasize the universality of the tragedy, highlighting the international nature of the reconstruction process. Cyrille Aufort started composing music for the theatre, short films and animation films before working extensively in the cinema. While working as an orchestrator for Alexandre Desplat, Aufort’s first major composing credit was Vincenzo Natali’s DNA-based sci-fi horror Splice, starring Adrien Brody and Sarah Polley. In 2012, Aufort and Gabriel Yared co-composed the score for A Royal Affair, the historical drama starring Alicia Vikander and Mads Mikkelsen. His more recent credits include Yann Gozlan’s A Perfect Man, Avi Nesher’s Past Life as well as the new Arctic-themed documentaries of Luc Jacquet: The Ice and the Sky and March of the Penguins 2: The Next Step, which won the Award for Best Original Music Emmy in the Mini Series, Film or Special category and a Hollywood Music in Media Award for Best Original Documentary Music. latest release with the label is the French comedy Knock. MovieScore Media once again teams up with Miguel d’Oliveira, one of the most in-demand composers of the British television documentary scene. 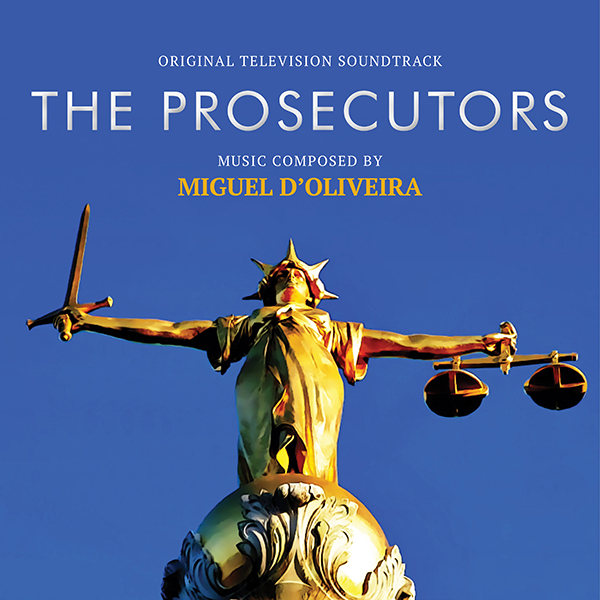 Following up releases like Joanna Lumley’s Trans-Siberian Adventure (2015) and Michael Palin in North Korea (2018) where Miguel had to underscore unique foreign cultures, his latest score for The Prosecutors finally takes him back to his native Britain. The three-part series is documenting the work of the Crown Prosecution Service, following a number of cases over an 18-month period and focusing on three different parts of the process: The Charge, The Proof and finally the Trial. “The Prosecutors was an interesting and challenging canvas to write for” explains the composer about the trials around his score. “The network wanted a big-drama-series kind of soundtrack but me and the directors were constantly trying to root everything on the fact that these were real life stories. I hope I was able to give it a strong body and all the gear changes. Always with an eye on the scale. You push it too far and the whole thing gets derailed.” The unique blend of high-scale drama and human interest stories results in a mesmerizing drama score that captures the very essence of sin, guilt and innocence as each of the cases get resolved by the end of their respective episode. Intrada revisits an early 1990s release with an expanded, 2-CD set featuring composer Craig Safan's magnum opus, Son of the Morning Star. Initially released in 1991 at the time of the miniseries' airing and out of print for many years, collectors have often requested Intrada revisit, expand and reissue Safan's emotional, musical journey of George Armstrong Custer and his last stand. Four ideas anchor Safan’s orchestral score. His haunting theme for Custer conveys much -- usually voiced on solo trumpet, it references Custer’s military career and embodies a sense of Americana, while also capturing the general’s solitary, independent nature. Preceding Custer’s theme at the outset of the film is a series of three chords orchestrated for strings designed to evoke a sense of tragedy, as the inevitable conclusion looms just hours away in the film's narrative. A second theme, usually orchestrated in lush, impassioned strings, is what Safan refers to as “the big emotional melody,” inspired in its creation by Samuel Barber’s Adagio for Strings. Finally is "Libby's Theme," reflective of her relationship with Custer and the steadying influence she exerts on Custer’s life. All together it creates a powerful journey to the tragic, forgone conclusion. For this new release, Intrada presents the music in picture sequence, including Safan’s Native American cues and the Irish-flavored cues that encompass the brief but important “Garryowen.” The source elements for this release were 2-track stereo session DATs made by veteran scoring mixer Dennis Sands, who helmed the 1991 orchestral recording sessions in Salt Lake City, Utah. 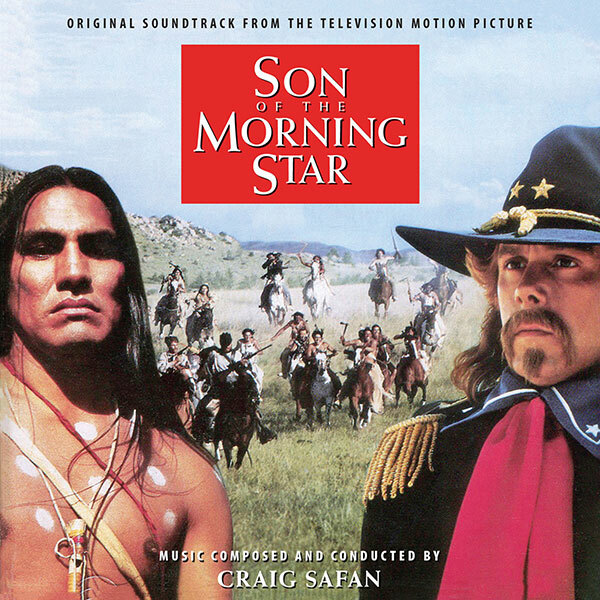 The title, Son of the Morning Star, was taken from a nickname given to Custer by Native Americans for his penchant to attack at daybreak. The controversial military leader, who graduated last in his class at West Point, became the youngest major general in the history of the U.S. Army during the Civil War, although he returned to his regular rank after the war and was a colonel when he died. Both book and film focus on the last decade of his life and its tragic end. 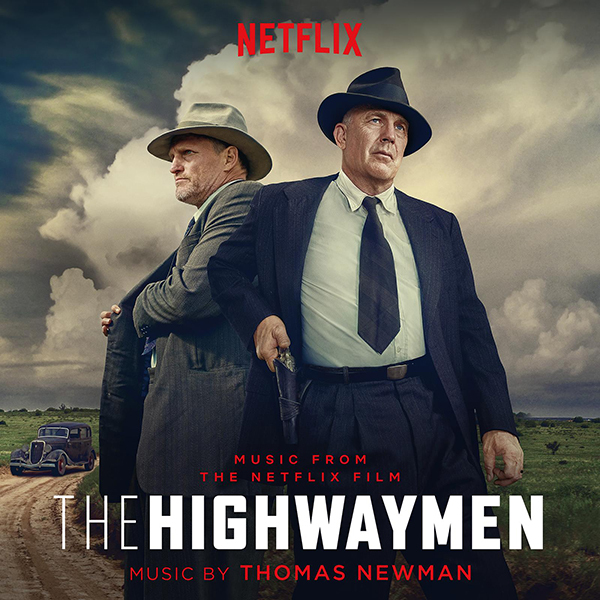 Sony Music announces the release of THE HIGHWAYMEN (ORIGINAL SCORE FROM THE NETFLIX ORIGINAL FILM), with music by GRAMMY®, EMMY® and BAFTA® Award-winning composer THOMAS NEWMAN, whose scoring credits include American Beauty, Six Feet Under, Skyfall, Finding Nemo and more. Available Friday, March 29, the soundtrack features music from Netflix’s newest original film, starring Kevin Costner, Woody Harrelson and Kathy Bates – available exclusively on Netflix Friday, March 29. 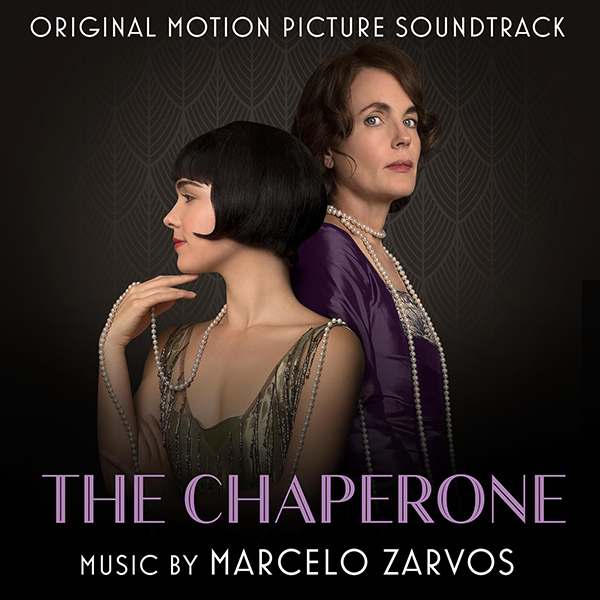 Sony Music announces the release of THE CHAPERONE (ORIGINAL MOTION PICTURE SOUNDTRACK) with music by Emmy Award-nominated composer MARCELO ZARVOS (Fences, Wonder, Sin Nombre) – available everywhere March 29. Originally making its premiere at the Los Angeles Film Festival, The Chaperone makes its theatrical debut alongside the soundtrack’s release on March 29. 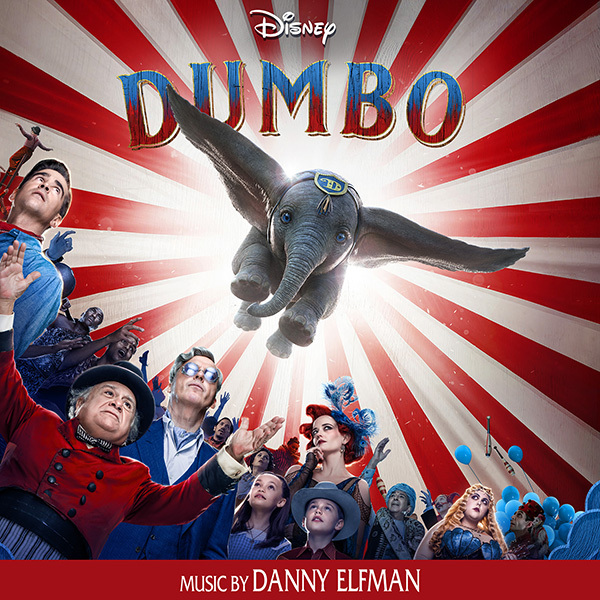 Walt Disney Records releases the digital soundtrack for the Walt Disney Pictures film “Dumbo” today, with the physical album to follow on April 5. Directed by Tim Burton and featuring a score by composer Danny Elfman, as well as the iconic song “Baby Mine,” “Dumbo” flies into theaters today. Perhaps the most memorable moment in Disney’s 1941 classic film is the poignant lullaby, “Baby Mine.” The soundtrack and film feature new versions of the iconic song. Sharon Rooney, who plays Miss Atlantis, performs the song in the film, and Grammy®-winning group Arcade Fire performs a touching acoustic rendition the end-credit version. 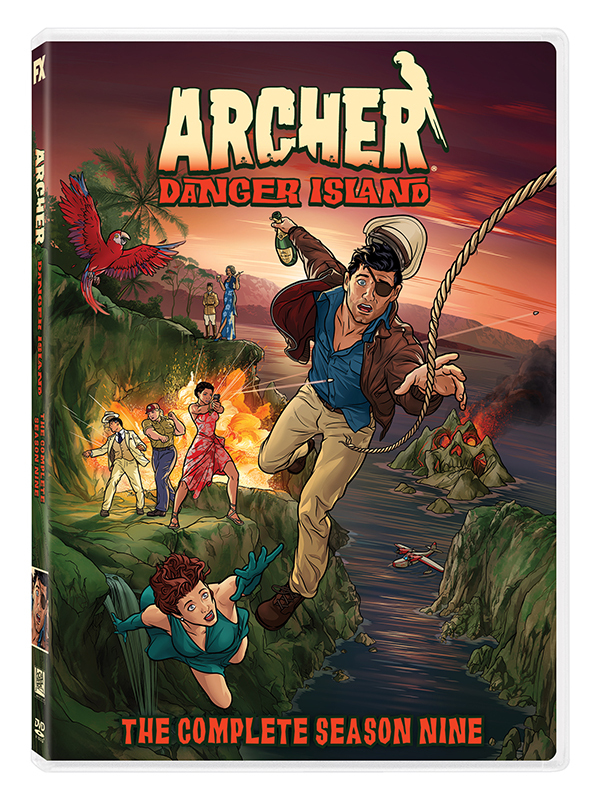 Twentieth Century Fox Home Entertainment... ARCHER: DANGER ISLAND: "The Complete Ninth Season Arrives on DVD"
Get ready for a change of scenery with the semi-functioning alcoholic seaplane pilot, Sterling Archer, a lush on the lush South Pacific island of Mitimotu in 1939. While the rest of the world is concerned about the impending Second World War, Archer is only concerned with who's buying his next drink. Along with his trusty co-pilot Pam, Archer must navigate quicksand, cannibals, super-intelligent monkeys, poison darts, pirates, and did we mention quicksand? 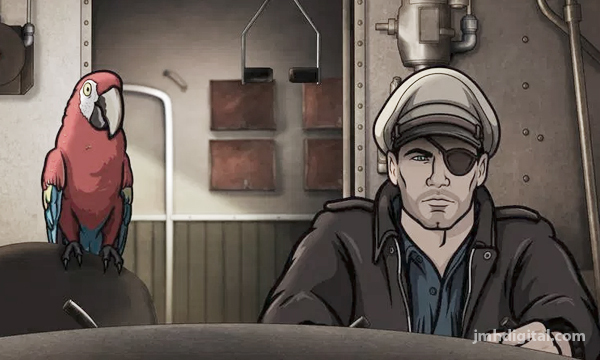 Enter the mysterious and deadly world of Archer: Danger Island when all 8 episodes from Season 9 arrive on DVD April 2 along with exotic special features. Clueless is a 1995 American coming-of-age romantic comedy film written and directed by Amy Heckerling. It stars Alicia Silverstone, Stacey Dash, Paul Rudd and Brittany Murphy. Clueless was produced by Scott Rudin and Robert Lawrence. It is loosely based on Jane Austen's 1815 novel, Emma, with a modern-day setting of Beverly Hills. The plot centers on Cher, a high school student, who befriends a new student named Tai. Clueless was filmed in California over a 40-day filming schedule. The film's director, Heckerling, studied real Beverly Hills high school students to learn the lingo and to understand how real teens in the 1990s talked. The famous quote "as if!" came from Heckerling's study of these teens. Okay, guess who was one of the couple hundred of people watching this happen "LIVE", talk about this event going viral "CLICK HERE" to see the buzz. Honestly this was so very cool, for the obvious reasons... but it was great catching up. I had shot some video, but honestly unless you want to see my view from the right corner of the stage, I suggest you check out this "SYFY WIRE" link to whole event. 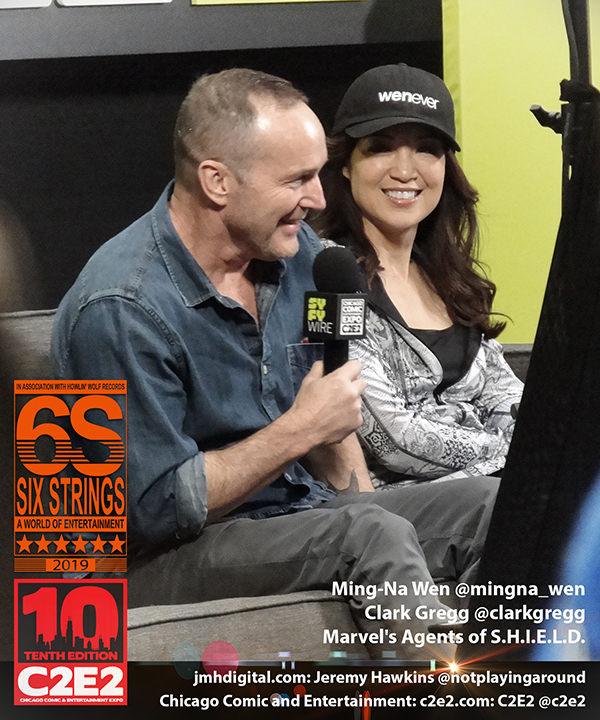 C2E2 BRINGS "MARVEL AGENTS OF S.H.I.E.L.D." 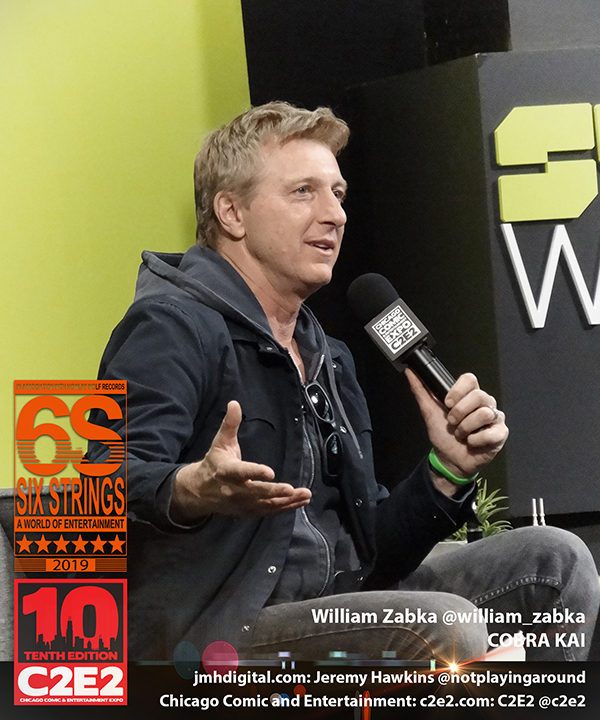 and SIX STRINGS WAS THERE! Marvel's Agents of S.H.I.E.L.D., or simply Agents of S.H.I.E.L.D., is an American television series created for ABC by Joss Whedon, Jed Whedon, and Maurissa Tancharoen, based on the Marvel Comics organization S.H.I.E.L.D. (Strategic Homeland Intervention, Enforcement, and Logistics Division), a fictional peacekeeping and spy agency in a world of superheroes. It is set in the Marvel Cinematic Universe (MCU), sharing continuity with the films and other television series of the franchise. The series is produced by ABC Studios, Marvel Television, and Mutant Enemy Productions, with Jed Whedon, Tancharoen, and Jeffrey Bell serving as showrunners. 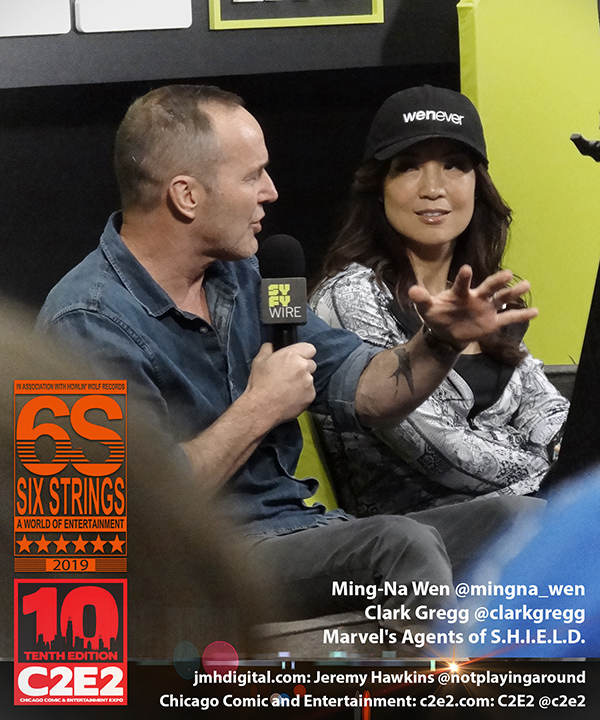 The series revolves around the character of Phil Coulson, with Clark Gregg reprising his role from the film series, and his team of S.H.I.E.L.D. agents, who must deal with various unusual cases and enemies, including Hydra, the Inhumans, Life Model Decoys, and alien species such as the Kree. Joss Whedon began developing a S.H.I.E.L.D. 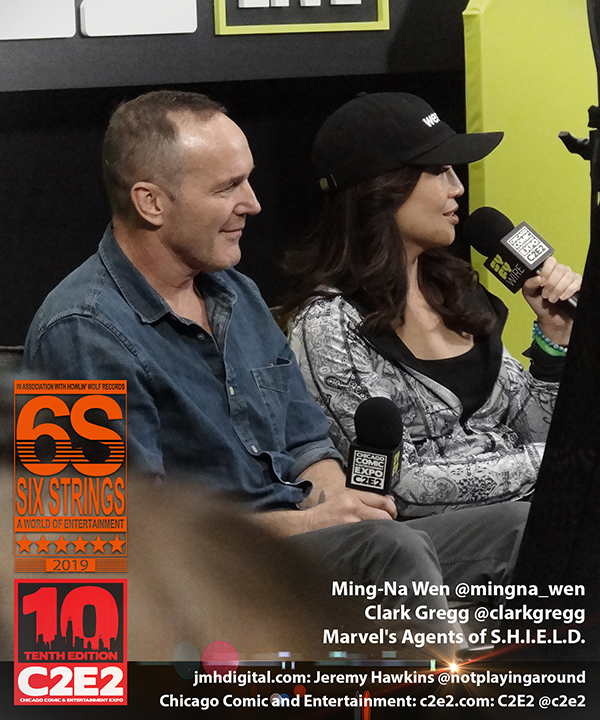 I have enjoyed this show for the entire run and for my Clark Gregg as Agent Coulson is one of the best underrated heroes of the entire Marvel Universe. Of course May has his back, so it was another treat to be in the same room with these two. Check out "SYFY" coverage, it's better than what I had shot. 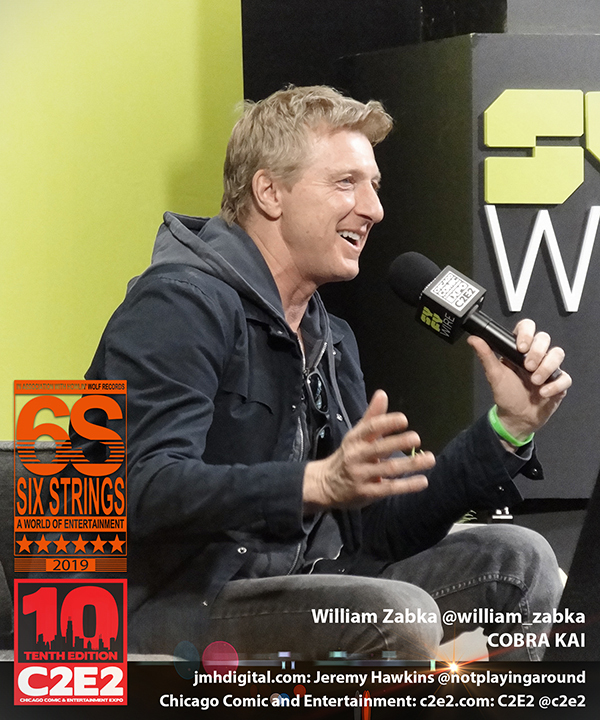 C2E2 BRINGS "COBRA KAI" TO THE STAGE and SIX STRINGS WAS THERE! No words here, greatest return of a set of characters in I think in history... prove me wrong! 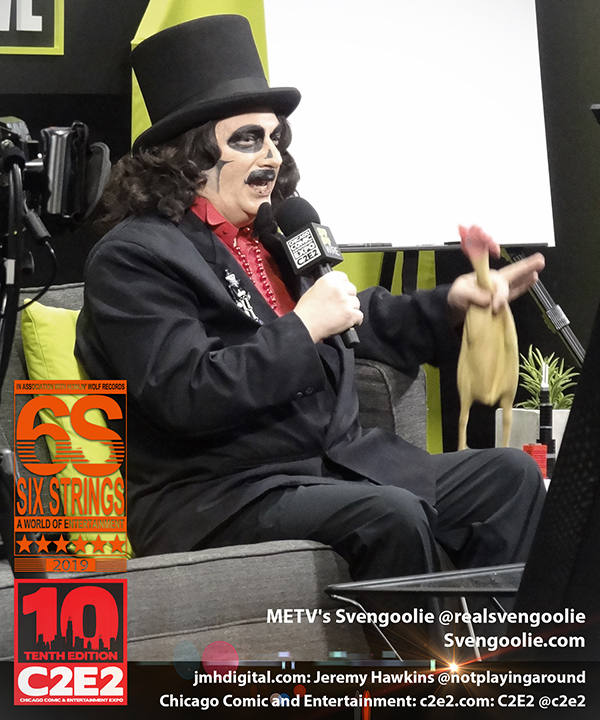 Svengoolie is a hosted horror movie show in the U.S. The show's title is taken from the name of the character host. The show is a long-running local program in the Chicago area and in recent years expanded nationally, airing Saturday nights on MeTV. The show airs both low-budget and classic horror and science-fiction movies, with host "Svengoolie" – a telescoping of the words Svengali and ghoul – played by Rich Koz (pronounced "Koze"), who wears thick skull-like makeup around his eyes, a moustache and goatee, a fright wig, all black, and a black top hat, along with a tuxedo jacket over a bright red, open-collared, button-down shirt. He is simply an icon and this year got his honors! 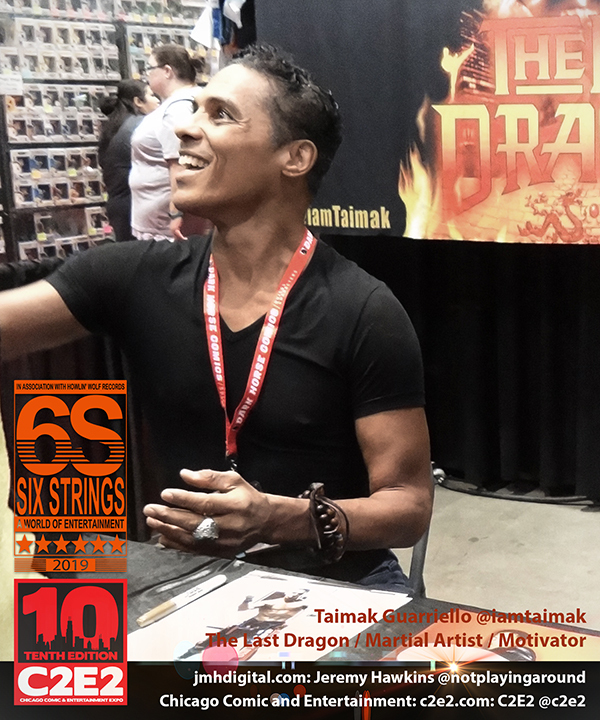 Taimak's leading role in Berry Gordy’s The Last Dragon, in which he played Leroy Green, a Bruce Lee-inspired martial artist in search of "The Glow", was his first major break in acting. The film was a financial success and grossed more than $25 million at the box office. 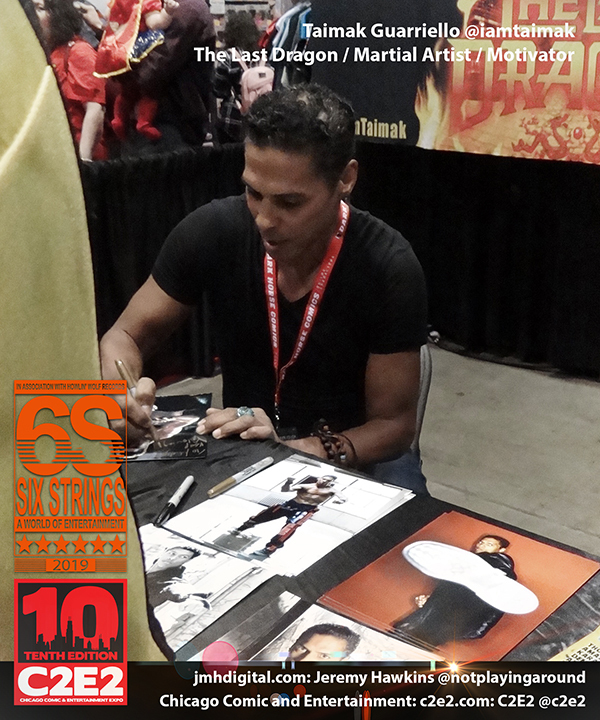 In addition to his acting career, Taimak operated a gym on the Manhattan's East Side in New York city called Fitness Concepts, that he opened in 2002. However, due to time constraints, he has since parted ways with the partner but may reconsider re-opening another gym in the future. In the interim, Taimak completed Taimak FIT (Find Inner Transformation) the first installment of a series of fitness DVDs. He is an accomplished martial artist and has received black belts in Goju Ryu Karate, Jeet Kune Do, Wing Chun, Hapkido, Jujutsu, Taekwondo & Brazilian Jiu-Jitsu. He studied Chinese Goju under "The Black Dragon", Ron Van Clief. He was right there, I could have talked with him... I had my celeb jitters. 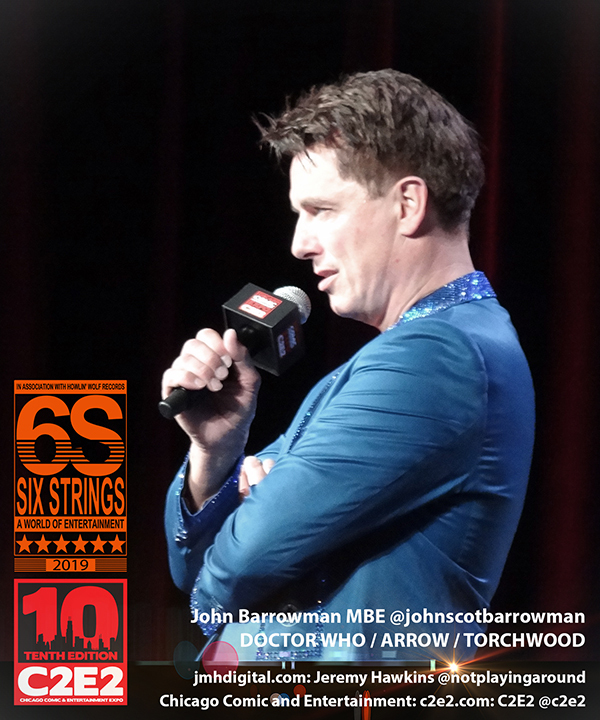 Alongside his theatrical career, Barrowman has appeared in various films including the musical biopic De-Lovely (2004) and musical comedy The Producers (2005). 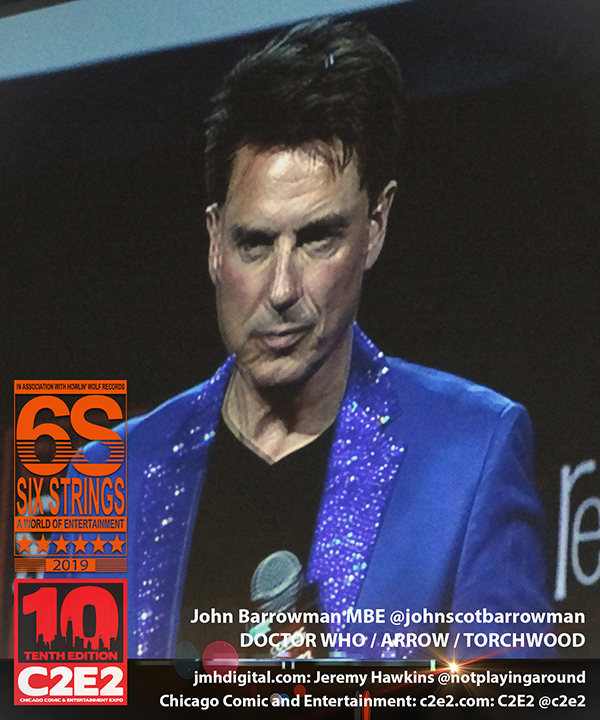 Before venturing into British television, he featured in the American television dramas Titans and Central Park West but he is better known for his acting and presenting work for the BBC that includes his work for CBBC in its earlier years, his self-produced entertainment programme Tonight's the Night, and his BAFTA Cymru-nominated role of Captain Jack Harkness in the science fiction series Doctor Who and Torchwood. 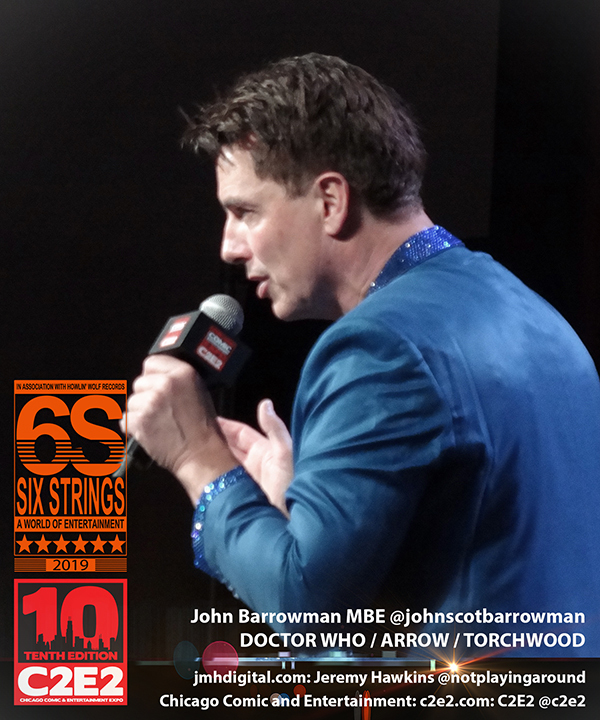 Barrowman has also had a number of guest roles in television programmes both in the US and the UK. He appeared as a contestant on the first series of celebrity ice skating show Dancing on Ice while his theatrical background allowed him to become a judge on Andrew Lloyd Webber's musical talent shows How Do You Solve a Problem like Maria?, Any Dream Will Do and I'd Do Anything. In 2006, he was voted Stonewall's Entertainer of the Year. He hosted the BBC One quiz show Pressure Pad in 2013 and 2014. Barrowman starred in The CW's Arrow and Legends of Tomorrow as Malcolm Merlyn. I got to the tail end of his panel, this man is hilarious!